I'd like to introduce you to my friend Kathy Racoosin. Kathy is known for her mad coloring skills, and she's currently hosting an awesome challenge for crafty types like you. 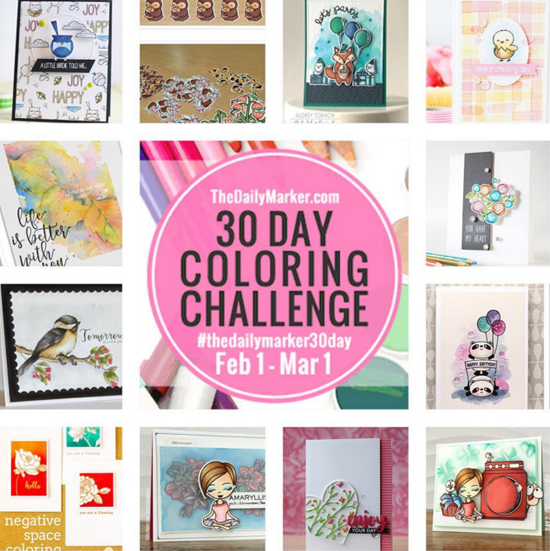 It's called the 30 Day Coloring Challenge. The premise is simple: Color something daily using any medium even if it's just for five minutes. That's it! If you check out #thedailymarker30day on Instagram, you'll be able to see inspiring posts from people all over the world following along. We thought it would be fun to get some cute My Favorite Things product in Kathy's hands to see what sort of magic she could do, and she did not disappoint! Take a look at the cute card that she created below inspired by our Sketch 267! 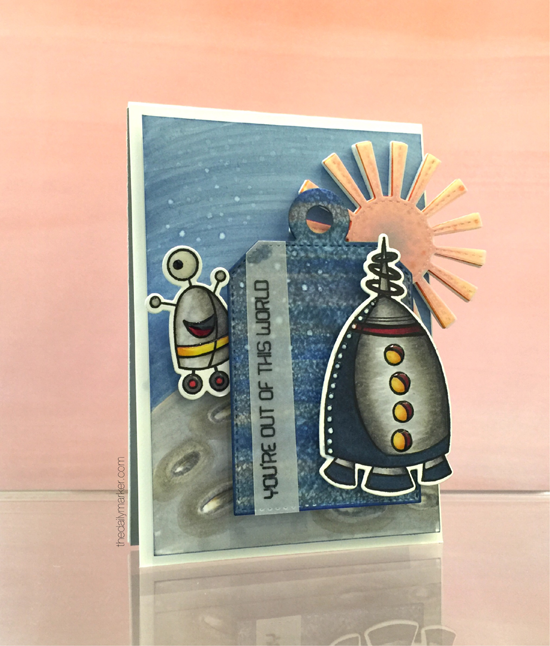 Kathy was inspired by the brand new Out of This World stamp set and Die-namics and the Sunny Skies Die-namics from My Favorite Things. Just look at that magnificent shading! Practice sure does make perfect! Now for something FUN! Leave a comment on this blog and then head to Kathy's blog and leave a comment there to be eligible to win a $50 gift voucher from My Favorite Things! You'll be able to chose from a wide variety of cute stamp sets and Die-namics to fuel your every coloring desire. Do you love card making challenges? Be sure to participate in our weekly Wednesday Sketch Challenges and our bi-weekly MFT Color Challenges right here on this blog. We encourage you to play along with us. 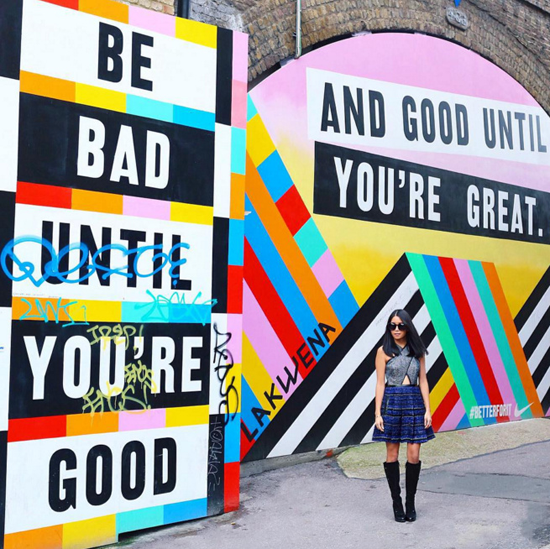 For even more inspiration, be sure to check out the My Favorite Things blog every day! You never know what kinds of fun things you'll see. Today we are featuring four creative spaces that are sure to inspire you. Click the image below to check it out. And there's an opportunity to win one of two $50 gift vouchers there as well! Here's to a colorful and creative weekend! The shading is amazing! Great card! Practice definitely makes perfect...this is awesome! This is adorable! Your work always amazes me. Super FUN card, amazing coloring!!! Super coloring ... wonderful inspiration. She makes it look so easy! I'm still having a problem getting my stamping right! But I have really enjoyed her challenges. It gives me an excuse to do something that totally relaxes me and gets my head right! She's right: even if it's just a few minutes. I would love to see how she did the moon. She said it was easy. Hmm...maybe I'll go pull my grays and give it a go! Thanks for a chance to win. Awesome coloring. I'm heading over to check out Kathy's blog! This card is too funny! Love it! Cute card and wonderful coloring. Such a cute card for my grandson. I love it. Coloring every day is such a fun challenge. We all need practice! Came over from Kathy's. Love the coloring! What an awesome card! I love the sketch interpretation here! The background is amazing wow! Love tnis technique. I am going to try it today. What a great inspiration. Wow! Such wonderful inspiration from such talented people. I'm going to go get a cuppa and keep scrolling through. LOVE the Out Of This World card BTW. I have 9 grandchildren and six of them are boys and they're so hard to make cards for. Keep the ideas coming! What a cute card. So fun! I came here from Kathy's blog! I love this card! Thanks for the chance! I love the shading of the moon! !